I should have been an architect. I love looking at historic homes and buildings, but I also love contemporary structures too. My cousin is an architect in Vermont and he designs green homes. 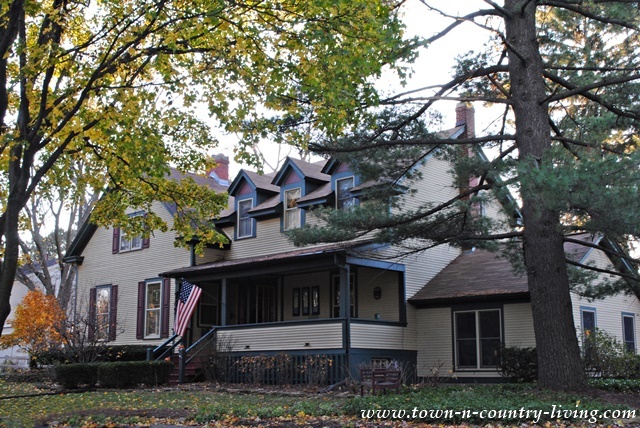 My favorite small town for taking a walking tour of historic homes is my birthplace of Geneva, Illinois. 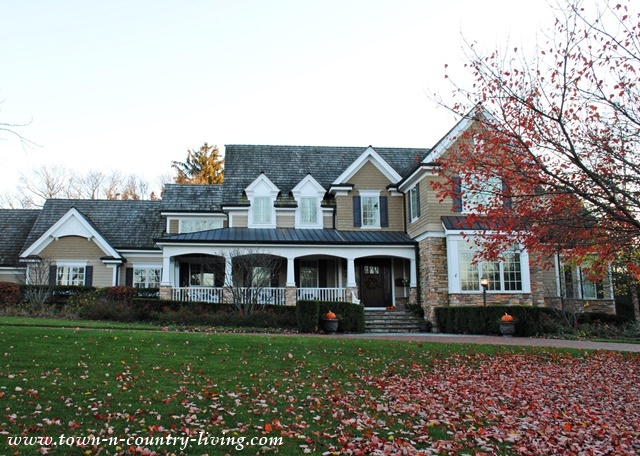 There’s such a great variety of home exteriors to enjoy. I love love love this clapboard house! 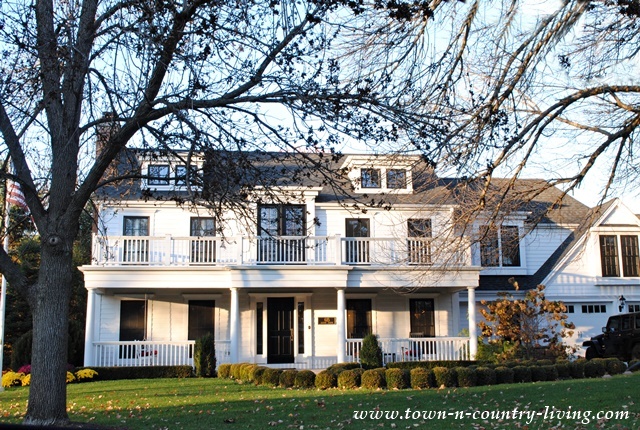 It has all the charm of yesteryear and it’s well-maintained. I would move here in a heartbeat! It’s so cute and charming! 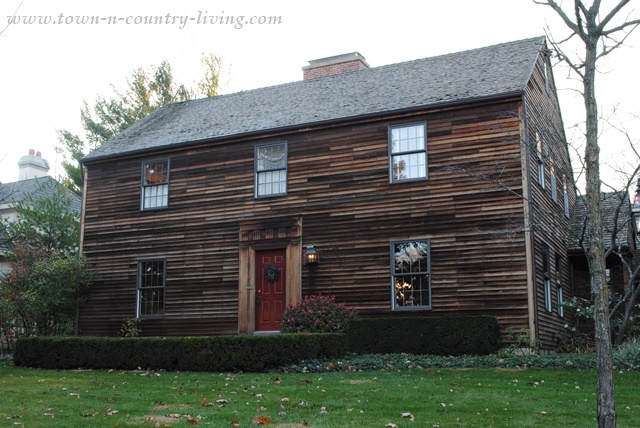 Check out the clapboard siding on this historic home. I love the variance in the shades of wood. I’ve never seen a home with this type of siding before, but I really like it. And of course, how can you not love a red front door? My hubby thinks white houses are boring. Seriously?? This stately home is gorgeous. This particular neighborhood in Geneva is located on the southwest side. The yards are larger, and so are the homes. The area was developed over the years so there’s a variety of architectural styles. Some of the homes are quaint and simple. 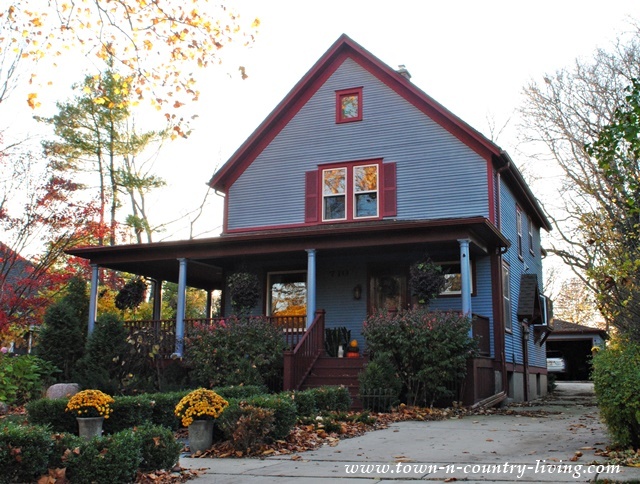 This blue charmer has a deep, wrap around porch. While another house just blocks away exudes estate style living. Simple lines enhance this traditional Cape Cod home. I love this house. It’s neat, tidy, and symmetrical. 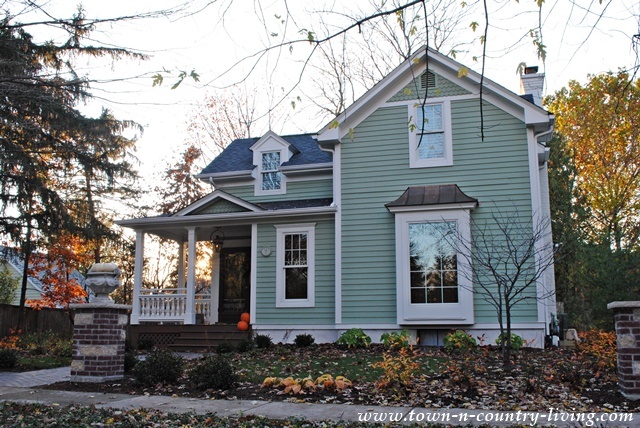 I think the farmhouse exterior is my favorite style. No surprise there. 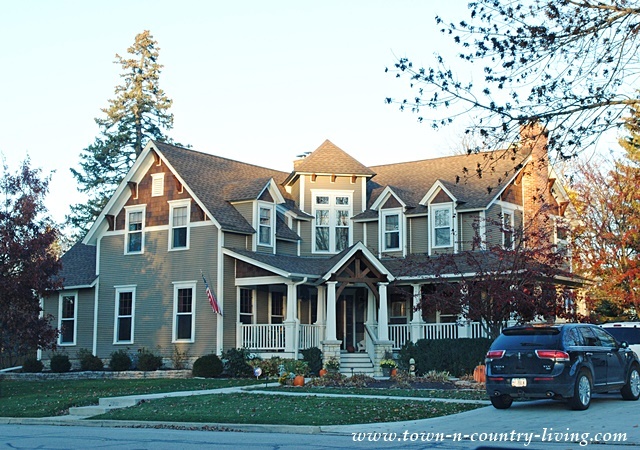 Big porches and dormer windows add the charm of days gone by. This home exterior was upgraded to something a little more contemporary, but it still retains its pretty appeal. This house on the hill wears a bit of a Victorian vibe. Notice the diamond shaped window dividers. 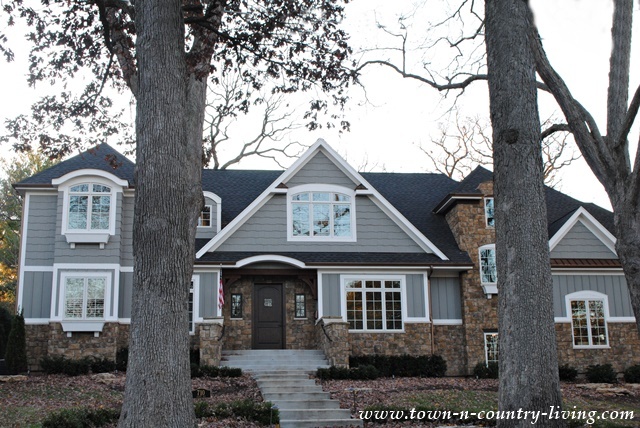 It looks like a storybook home and I’ll bet the interior is stunning! Another older home with its exterior updated. I love the mix of wood and stone on this house. I feel like I keep saying the word “love” in this post. 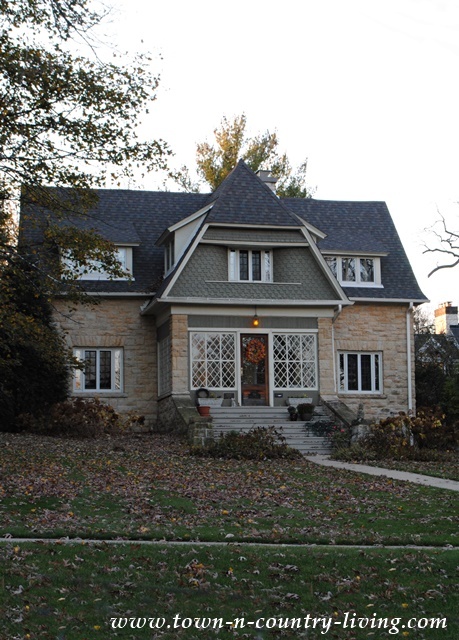 Fall is the perfect time of year to take a walking tour of historic neighborhoods. The temperature was perfect on this late Saturday afternoon. After our excursion, hubby and I enjoyed dinner at the historic Patten House. 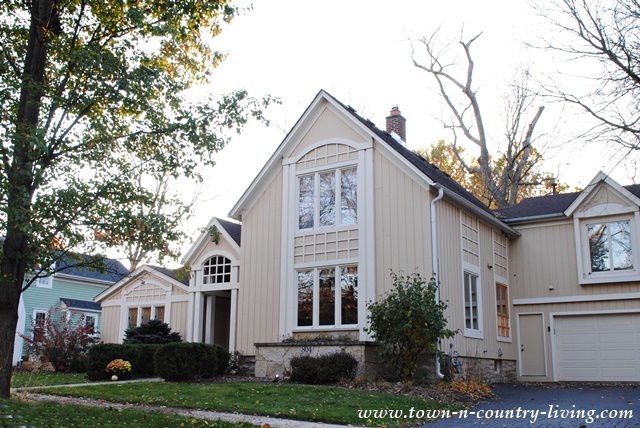 I hope you enjoyed this tour of an historic neighborhood in Geneva, Illinois with beautiful home exteriors. Geneva is a great place to spend a weekend afternoon, with its unique shopping and historic districts. Not to mention the restaurants are fabulous! Speaking of food and drink, I recently launched my new blog … Blonde on Wine! I’m sharing wine from the lay woman’s point of view. From reviewing wine to cooking with wine to food pairings … if it has to do with wine, I’ll write about it in the new blog. 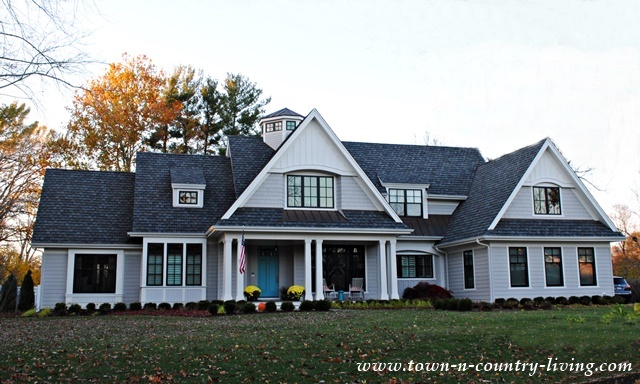 So tell me, which of these beautiful home exteriors is your favorite? 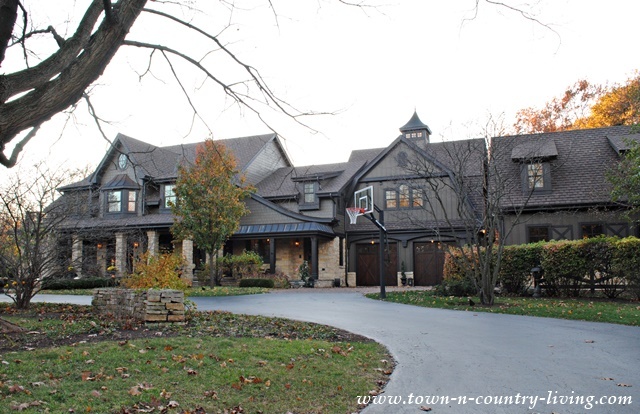 HI Jennifer, I really enjoyed the walking tour of these beautiful homes. What a lovely old town Geneva must be. If I had to choose a favourite it would be the first one. Thanks for sharing. Have a wonderful week. The 5th last photo is my absolute favourite! I love houses that look like this, I also tend to go for a more traditional, old style look. These are honestly all dream houses in my opinion, I love your taste! This is such fun. I love them all. I would love to see the inside. You and I definitely share a love of beautiful architecture, Jennifer! I adore the homes you shared today, and the old, historical ones always speak to my heart. 🙂 No wonder you love living where you do! These homes are just amazing! You have so darn many ads on your blog, that I can’t see the postings for the ads!!! They’re all beautiful but I am especially drawn to the more contemporary one. That’s based on the outside only, of course – I could change my mind instantly by going inside. What a pretty town, your birthplace. I can see why you used the word love so often, I found myself saying it right along with you! That last home? WOW!! Lest say wow love to that one, I love the use of yard space with the front door entrance as of the home was a Conner lot yet just the entrance is, unique road appeal and a beautiful Charm. Loved your home tour, and always enjoy what you inspire. 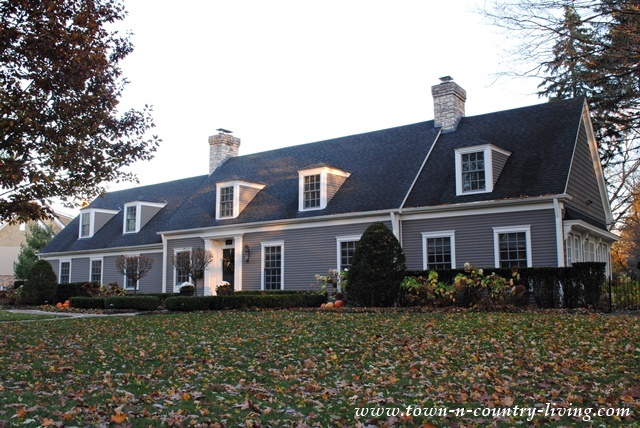 I liked two of the housed: In my part of the country the Traditional Cape Cod would be classified as Ranch Style with a few OS changes. I also liked the 4th house on the South Side of Geneva. If I can’t have Ranch then I will go City all the way.